last week we determined that the Apple Mac required updating to Snow Leopard and had ordered from apple unfortunately this was only available via post and not electronic download. Then we installed the HP Photosmart 5520 wireless printer on to the customers network and loaded the drivers on to the Apple Mac. In the end the customer was easily able to transfer music between the Apple Mac computer and the iPhone 5 as well as being able to print direct from either to the HP Photosmart 5520 wireless network printer. Good afternoon next today we are with a customer at Finham in Coventry between Canley and Willenhall we are here to fix a number of computer problems. Most of the computer issues here were simple to fix but a few are worth noting. To print an email from BT Yahoo’s web site since the last web mail upgrade you now need to open the email and click actions then click print message other wise all you get is the advert, header and footer being printed. Good morning today we are at a customers in Coventry to help with some computer support. This morning we are in Coventry repairing a computer for a customer, the fault described is that the machine is not booting and the date is reading as 2003. We suspect it just needs a replacement battery so will be taking a selection of standard batteries. Update : as suspected to repair the mesh computer it needed a new battery this one required a CR2032. This afternoon we are at Wolston in Warwickshire working for Dental Chrome Systems of Coventry. We are here to repair a laptop computer with a “Profile Error” on boot up this machine is running Microsoft Vista and had just been running some updates the night before the error had occurred. We ran system restore and took it back to the point before the updates and got the machine working properly again, then we made sure the internet security was up to date, reinstalled the updates and tested by rebooted a few times, The machine is still working. For the afternoon we are at Westwood Heath near Warwick Univeristy in Coventry. Today we are with Matix Lasers of Coventry, one of the problems we have here is sage locking out users with the error “The user you entered is already logged in” to get around this you need to find the queue.dta file and rename or delete it, It is usually found under Program files, Sage,Company number. We also performed other maintenance whilst here. This morning we are at a customers in Cheylesmore, Coventry we are here to perform maintenance in a computer system as well as bring a replacement mouse for the customer. This morning we are at a customers in Coventry to solve an internet banking problem on 4 out of 5 of the customers computers. After spending some time updating the antivirus, Flash and JAVA on all the computers involved we rang The Royal Bank of Scotland, We discovered after a lengthy call that the bank had changed the website substantially but had not added a code to reload the page so literally all we needed to do was clear the browser cache and press F5 Grrrr. It does not take much to produce good code but bad code can waste an awful lot of time!. This morning we are in Coventry at Matrix Lasers repairing an old Computer running Windows XP. This morning we are back in Coventry at Matrix Lasers repairing a laser cutting machine by replacing a part sent from the manufactures, this required a drawing being made of the current connections on the faulty board and swapping the board over. While here we also did some other computer and network maintenance on the office computer systems. This morning we are in Coventry at Matrix Lasers repairing a computer that is attached to a plasma cutter. 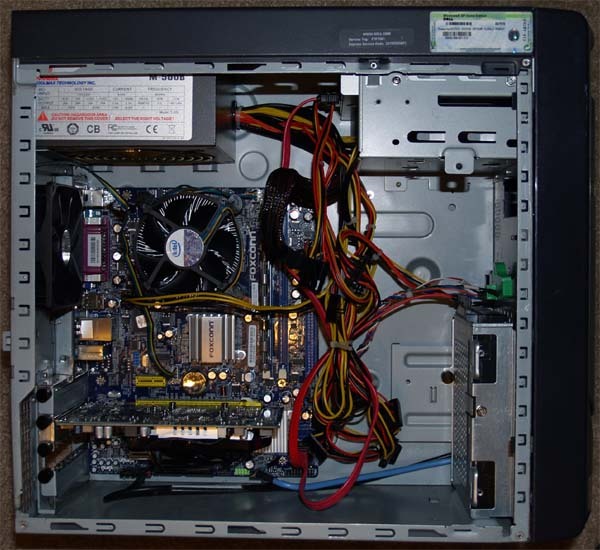 It required a new 2.5″ hardrive fitting and the software reinstalling for the machine. We also helped to fault find on a Laser cutter for which a replacement part was ordered from the manufacturers in Slovakia. Good afternoon, We are with a customer just off of the Fletchemstead Highway in Coventry, We are here because the customer has reported that their Sony Vaio VGC-LN1M Computer has died, upon confirming that the power supply was dead we checked the Sony website to find that there was a product recall and although out of warranty was able to get a product replacement free of charge. Update: only took 2 Days for the Replacement power supply to arrive. Good Morning, We are with Matrix Lasers at Endemere Road, Holbrooks in Coventry, We are here to remove a Trojan virus from one of the office computers and restore all the icons and settings for the desktop. We are now with a customer on Main Street at Wolston in Warwickshire. We are here because the customer has reported that their computer is running very slow, its a Compaq Presario laptop computer running Microsoft Windows Vista we cleaned up the computer by editing the registry and running a Malwarebytes scan which helped matters, but it was supplied with only 1 Gigabyte of RAM and Microsoft Windows Vista really needs 4 Gigabyte of RAM or more to work smoothly, We have recommended the customer to buy a 4 Gigabytes RAM upgrade for which we have supplied the part numbers. We are now at Coventry Laser on Endemere Road in Coventry, We are here to look at the computer connected to a waterjet cutting system, The computer has been randomly rebooting, We checked the temperatures and they seemed ok so the only likely suspects are the power supply or the power supply side of the main board, We tested with an alternative power suppy unit and this solved the issue. Next today we are with a customer at Jacklin Drive in Coventry, We are here to solve an intermittant connection issue the customer has been having with their BT broadband connection and also clean up the computer system including checking the registry. Next today we are with a customer on Foreland Way at Keresley in Coventry, We are here to remove a Trojan Virus from the computer and then update the customers antivirus to AVG 9, and check the firewall. Oddly this virus had been effecting the DVD Drive in normal operation making discs unreadable. Took about 2 hours to get home tonight the traffic was moving ok but I guess the snow put every one off better safe than sorry. Next today we are with a customer at Earlsdon in Coventry, We are here to Setup a Sony reader with a computer , This involved reorganising the files to make it easier to find on the computer and setting up the Sony Book Reader. Good morning today we are at a customers on Main Street at Wolston in Warwickshire near Coventry, We are here to install a wireless bridge system of two access points, The main objective of this is to share the buildings internet connection in the office at the side of the house with with the rest of the building, We managed to do this using only 2 access points one which has to be wired to the main router and the other in a convenient location in the house on route to the areas requiring access. Good morning we are at Matrix Lasers at Holbrooks in Coventry, We are here to repair a computer and setup the outgoing email for two of the sales Computers, Plus Various other Computer and network maintenance. Good Morning today we are starting with a customer at Westwood Heath in Coventry. We are here to resolve some minor issues with an Apple Mac Computer the first issue requires us to all ways allow Key chain Access the second is that the computer is always loosing connection to the internet, This is resolved by fixing the router to one channel . For the next job today we are at Matrix Lasers at Holbrooks in Coventry, We are here because one of the main sales machines running Windows XP is not seeing the network, To clear this we checked the machine for malware then deleted the network driver, reset the winsocks and TCPIP Stack, Reset the computer and reloaded the network drivers, This fixed the machine. 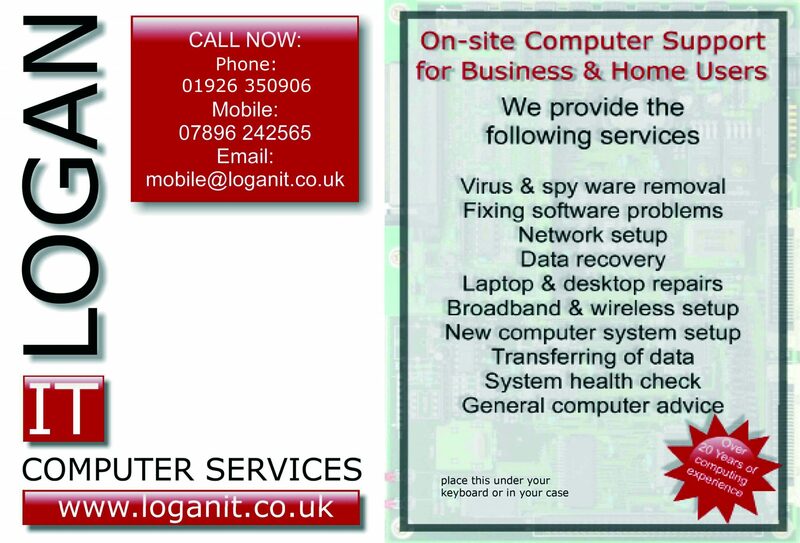 Good morning today we are with a customers at Stivichall in Coventry, Today we are working on a Desktop PC using Windows XP, setting up the customers Email on Outlook Express, Installing Service Pack 2 and Updating the antivirus to AVG Free 9.0. This morning we are in Coventry repairing a computer for a customer. The fault described is that the machine is not booting and the date is reading as 2003. We suspect it just needs a replacement battery so will be taking a selection of standard batteries. Good Morning today we are with Coventry Debt Collection at Westwood Heath near the University of Warwick in Coventry, We are here to Repair an iCube Shuttle XPC Computer and other network maintenance such as setting up a HP Wireless Printer. Good Morning today we are with a customer at Gibbet Hill in Coventry , We are here to upgrade the customers Dell Inspiron 1525 Laptop computer from 1 to 2 GB of RAM, Doing this has turned this machine from an extremely slow machine in to a fairly quick one. Good Morning today we are with a customer at Gibbet Hill in Coventry , We are here because the customers computer is running slow, The computer it’s self seems to be running correctly so we have removed unneeded programs from the start up on the laptop computer and edited the registry the machine is faster but still quiet slow it has been determined that the Dell Inspiron 1525 Laptop computer that has been supplied with Vista and only 1Gb of RAM is under the required specification, To make it run smoothly in fact all vista machines should have a minimum of 2 Gb of Ram, This has been recommended and the customer has ordered.